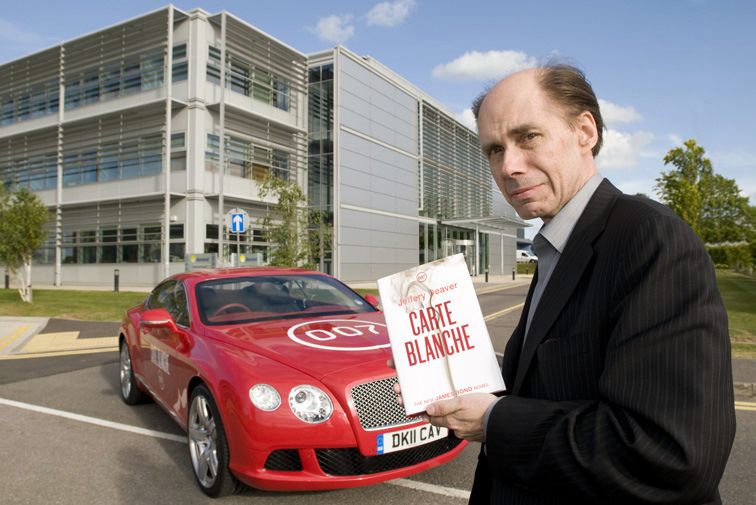 By a series of very fortunate events, last Friday we were proud to host one of only three public events in the UK to coincide with the launch of the new James Bond novel 'Carte Blanche', with the book's remarkable author Jeffery Deaver. Jeffery was shown the science and engineering behind the facility, and its use in everything from materials research to drug design, via food manufacture, document preservation and the potential for forensic analysis. 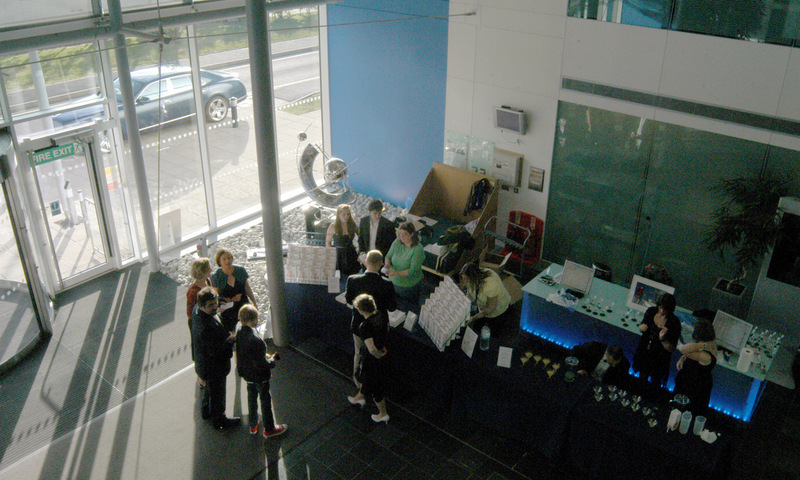 Meanwhile, the Mostly Books team of staff and volunteers were setting up in the atrium in preparation for the main event. Guests also had a chance to to take a peak inside the synchrotron, thanks to the Diamond staff on hand giving sneak-peek tours. 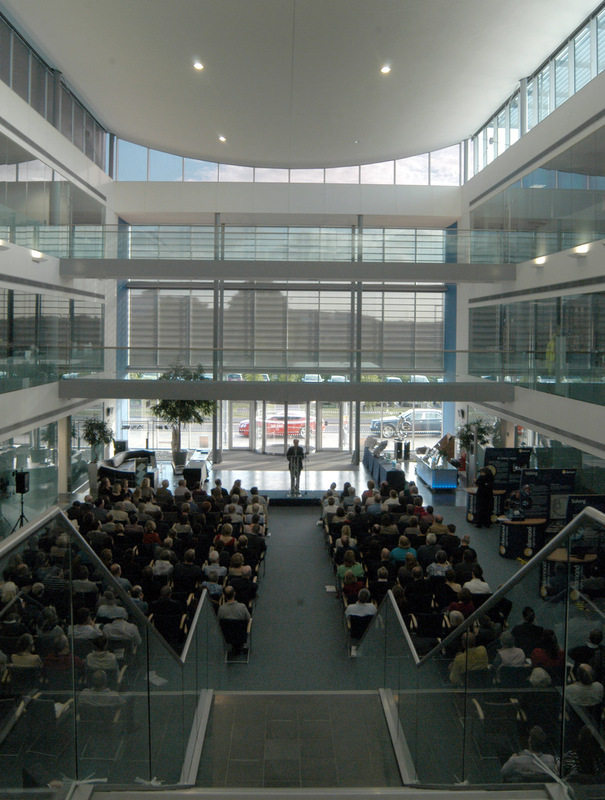 It's a breathtaking facility, hard to believe it's on our doorstep, with much of the research going on possible nowhere else in the world. Far from being outdated, Bond is probably more relevant now than he ever was. Fleming created a hero whose characteristics - loyalty, duty, right action - can be applied anew in every age. (Deaver's book recognises this incidentally in the dedication to Fleming at the beginning: "To the man who taught us we could still believe in heroes"). Jeffery is a consumate speaker, and took the audience through the story of how he came to write Carte Blanche, how Fleming influenced him as a young reader, and how a 'Jeffery Deaver novel' comes to be written. (Gaskella has written a fabulous summary of his talk here). 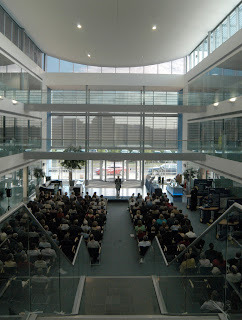 We had questions - and then a signing afterwards. Jeffery seems to genuinely enjoy meeting readers, and I can see why his die-hard fans (or which several were in the audience) travel great distances to meet him. 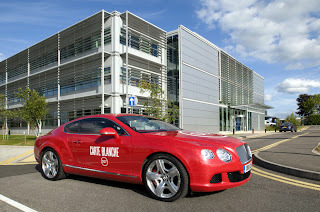 ...and then those Bentleys whipped him away, bound for the Hay Festival the next day via an Oxfordshire Hotel. There is a list as long as your arm to thank, but to Laura, Dominic and Patrick at Diamond - the venue performed superbly and all the staff were amazing. Mostly Books staff and helpers had a very late night, and were a stunningly dressed and hard-working team throughout. To all our guests who braved a drive out to the wilds of Oxfordshire on the cusp of a bank holiday weekend - I hope you had a very entertaining and memorable evening (and are now enjoying the book!). 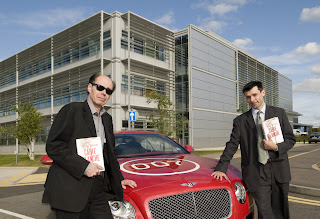 Thanks to Hodder in entrusting us with one of their most important authors and for giving us an amazing opportunity. And the redoubtable Katy, from Colman-Getty, now has a working knowledge of X-Ray defraction to go with her incredible skills in PR. Great post. Great title! 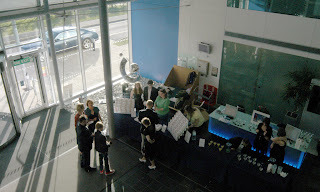 It was a super event - well done to all of you. I've just realised too that I've been spelling Jeffery wrong - will correct that for my book review later this week I hope. Glad you enjoyed it. And we might just have started a trend. 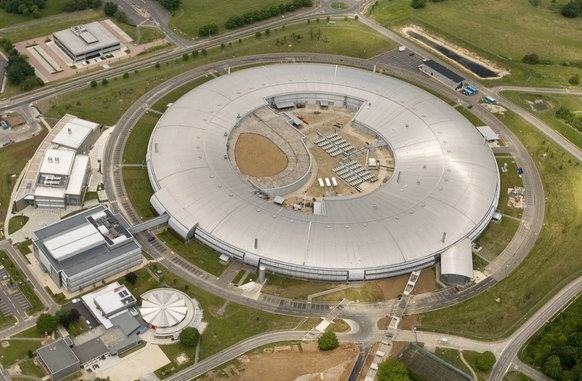 The Brookhaven National Synchrotron Light Source in the US is hosting a crime writer event on June 9th: http://bit.ly/mvHz0U.